Teflon is the trade name for PTFE (polytetrafluoroethylene), a polymer consisting of carbon and fluorine. Teflon was developed back in 1938 by a DuPont researcher named Dr. Roy Plunkett. The development changed the plastic industry forever. Plunkett and his DuPont team created one of the most slippery substances that exist. PTFE Fabric is not only beneficial for its nonstick property; it offers many other great qualities as well. The polymer is resistant to high temperatures, chemical reaction, corrosion, and stress cracking. These traits allow PTFE to be used for many different purposes. One common household use for Teflon or PTFE is cooking. Many kitchen supply brands market their Teflon pots, pans, and utensils. These products are safe and make cooking a lot easier. The non stick PTFE component guarantees your food will slide right off the pot or pans surface. Cooking sprays and grease are no longer needed when you cook and bake with a Teflon coded product. Another at home use for PTFE is with beauty products. Nail Polish is commonly infused with Teflon to create a strong, crack free product. Once applied, the Nail polish will stick to your nails longer with chipping. Many hair styling products, like curling irons and flat irons are also made with PTFE. The non stick coating helps the tools glide smoothly through hair, unaffected by the high heat temperatures. PTFE is also significant in the automotive industry. One frequent use is with windshield wiper blades. Manufacturers coat their wiper blades with Teflon so the well known "squeaky blade situation" does not occur. A fourth public use of PTFE is as protection for carpets and fabrics. Carpets and fabrics that include Teflon are less susceptible to stains. The PTFE acts as a repellant to liquids so spills can be easily wiped off. 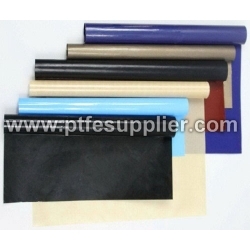 Besides household and personal use, PTFE is widely used in a variety of business industries. The Steel and Chemical Processing Industries are two prime examples. These industries need strong and reliable hoses and tubing to transfer highly caustic and corrosive chemicals. They work with high temperatures to produce their products or services and they have to have a means for withstanding the heat. Teflon is great since it is carries the heat resistant and corrosion or stress free characteristics. PTFE tubing and hoses deteriorates less rapidly than metal piping. Manufacturers are catching on to this cost saving technique. As you can see, PTFE properties are endless. They assist us with day to day tasks like cooking, cleaning, and driving. They contribute to our beauty prepping. And, PTFE's play a major role in the processes of industries like the Steel and the Chemical Processing Industry. Plunkett and DuPont might not have realized just how far their development would go. They created a product that remains essential to many functions in society today.